Yunggamurra : for voice, flute and cello / music by Betty Beath ; words by Patricia Wrightson. 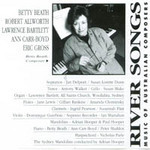 Yunggamurra, river spirit : for voice and piano / Betty Beath ; words by Patricia Wrightson. Yunggamurra is a setting of prose and verse by the Australian writer Patricia Wrightson, O.B.E. She responded to my request for permission to set some of her work by extracting the following from her book, 'The Dark Bright Water' which was first published tin 1979 by the Hutchinson Publishing Group Limited. "Yunggamurra, river-spirit, singing from the rocks; silver like moonlight, lovely, wet with dew like a flower. Her dark hair flows down to the rock and she combs it with delicate fingers. She combs it with delicate claws. Are you not coming? sings the bright water. Are you not coming? The glimmer-bright water alright with the glances of glimmer-bright eyes. Are you not coming? sings the dark water. Are you not coming? The dark-flowing water like washes and ripples of dark-floating hair. I sing in the sunlight with dark eyes aglimmer. Are you not coming? I sing in the shadows with dark hair down-flowing. Are you not here? Her eyes are lit with moonlight, soft and shining, and she smiles with the sweetness of honey. She is dark and silver like moonlit water, lovely and remote like a dream. Her song is sharp and sweet like wild honey: sweet with longing, sharp and sour with magic." I had made a long search for material to set and I was delighted with the above text provided by Patricia Wrightson, to do with spirits of Aboriginal myth and legend. Her images spark a strong response and were a challenge to me. Her work is subtle, mysterious, suggesting, for example, the Yunggamurra as both river spirit and aboriginal woman. 'YUNGGAMURRA, River Spirit', for solo voice and piano, is my setting of prose and verse by the distinguished Australian writer, the late Patricia Wrightson, O.B.E. In 1986 Patricia was awarded the Hans Christian Andersen Award, given for her total contribution to children's literature, the first time in the thirty year history of the awards that an Australian had been so honoured. 13 Aug 2013: at Lunch hour concert (Beath) (Wyselaskie Auditorium). Featuring Susan Lorette Dunn, Elyane Laussade. 1986: ABC. Featuring Susan Lorette Dunn. 1986: 4th International Congress of Women in Music, Atlanta, USA.